Significant performance improvements — 8GB of ultra-fast GDDR6 graphics memory technology provides over 40 percent more memory bandwidth than the previous generation Quadro P4000. 36 RT Cores — enable real-time ray tracing of objects and environments with physically accurate shadows, reflections, refractions and global illumination. 288 Turing Tensor Cores for 57 teraflops of deep learning performance — accelerate neural network training and inference, which are critical to powering AI-enhanced rendering, products and services. Hardware support for VirtualLink — new open industry standard meets the power, display and bandwidth demands of next-generation VR headsets through a single USB-C connector. 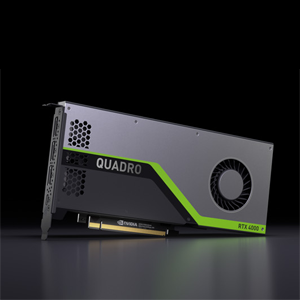 The Quadro RTX 4000 will be available from Authorized PNY Partners starting December 2018.